A Hamelex White B-double tipping combination has been chosen by McCarten Farms to help optimise their entire grain cartage operation. Seeking a sturdy transport solution that would be able to handle extremely rough terrain, the company decided to add the Hamelex White B-double trailer to their fleet. Phil Harries, Transport Manager at McCarten Farms and an industry veteran who spearheaded the acquisition of the Hamelex White B-double combination particularly admires the attention to detail in the production of Hamelex White equipment. He adds that the trailer is impressive not only in performance but also the finish. McCarten’s fleet consisted of one tipper and two road train dollies with each machine used to service the needs of the business in and out of the farm. They needed to buy new equipment to meet the company’s ever-growing workload. Phil notes that the usual delivery time for a standard B-double set is about three to four months; however, Hamelex White was able to give them a time window of just about six weeks. It was important for McCarten to find a trailer that could be sent into operation as soon as possible, and they decided to go with Hamelex White. McCarten Farms’ new B-double is based on a high tensile steel chassis fitted with a Meritor-built axle and air bag suspension combination. Overall, it boasts a payload capacity of 81m³ and banks on a wealth of quality equipment from Dutch hydraulics expert Hyva for the hoists; and Italian powerhouse V.Orlandi for the tow coupling. Additional features include sturdy roll tarps and access rungs. According to Phil, obtaining additional payload with aluminium trailers wasn’t a priority since McCarten mostly carts around farms using dirt roads and uneven surfaces in the country areas. They required steel trailers that could withstand the elements 100 per cent better than aluminium. He explains aluminium trailers are ideal on highways but not practical on uneven roads. Fourth-generation owner of McCarten Farms, Peter McCarten comments that the B-double has great towing capabilities, and offers first class performance, premium height controls with the tipper bins and excellent stability, and stands up well amid tough road conditions. 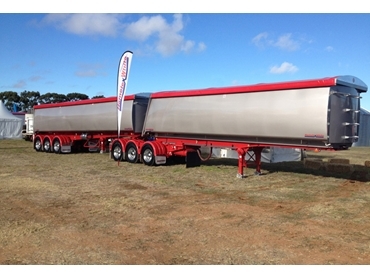 Another reason for purchasing the trailer was the rising transport cost from paddock to silo, with the B-doubles and road trains offering a highly economical and faster way to cart grain as a farming enterprise. In addition to the quality of equipment, Peter admires the speed of production by Hamelex White. The trailers also come with a solid warranty that even covers the axle system, which is something not offered by many manufacturers.